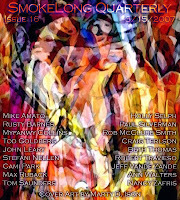 SmokeLong Quarterly issue #16, guest edited by the divine Ms. Alicia Gifford, is now available for your reading pleasure. Within you will find flash fiction by the likes of Rusty Barnes, Tod Goldberg, John Leary, Tom Saunders, Ann Walters, Nancy Zafris, and me. Please do enjoy and don’t forget to read the interviews!